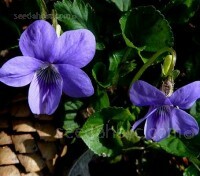 A very compact, small-leaved, plant that is exceptionally hardy and trouble free cascading variety. F1 Tumbola Bronze-Purple is a new introduction that will flower from early spring into late autumn. 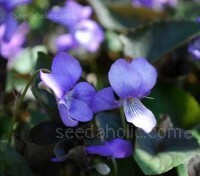 This cascading variety is certainly 'the' Viola for hanging baskets. 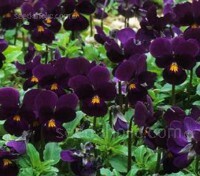 Viola 'King Henry' is a beautiful deep rich tone of purple. The face is lighter shade with a golden eye and deep purple whiskers. (King Henry used to be called “Prince Henry…until his promotion!.) Use as a groundcover, in borders and rockery, in baskets, containers and tubs. The legendary fragrant sweet violet: Viola odorata is often referred to as 'The King of Violets', with a beautiful fragrance and also several herbal uses. An excellent wild/woodland garden plant, it can be found near the edges of forests or in clearings. Introduced in Germany in 1900, 'Konigin Charlotte' are famously grown for their perfume. The violet coloured flowers are extremely fragrant, This cultivar is unique in that its flowers turn upward making them viewer friendly. 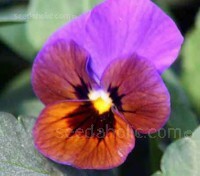 It is also one of the longest flowering violets with scented flowers. Also marketed as 'Scheekonigin' and 'Eismeer'. Cultivated in Switzerland in 2004 from the famous 'Queen Charlotte', One would think that 'Reine de Neiges', or 'Snow Queen' would be a white bloomer. The flowers are almost white, a clear crisp ice-blue. Long blooming and upward facing, their fragrance is intense. 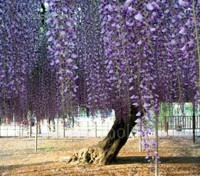 Wisteria sinensis is surely the most distinctive of climbers and by far the most captivating when in bloom. Bearing large pendent clusters of fragrant violet-lavender flowers in late spring to early summer, the foliage appears once the flowers are over. 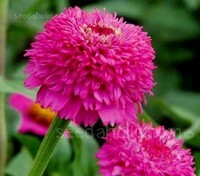 The 'Zinderella’ series is a breakthrough in scabiosa-flowered Zinnia breeding. A unique zinnia, that produces large flowered blossoms that are layered thickly with a stunning crown and contrasting dark centres. 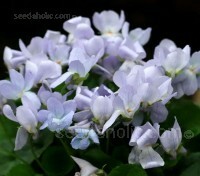 Because of this unique new colour 'Zinderella Lilac' has won the Fleuroselect Award. Zinderella ‘Purple’ is a magnificent shade of amethyst-purple. 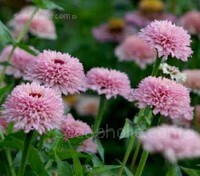 Growing to a height of 75 to 90cm tall and around 45cm wide, the blooms have a unique form, a pompom of tightly-clustered short petals above a multi-layered skirt of longer, daisy-like petals. Held on long sturdy stems they are ideal for long lasting cut flower arrangements.